January's update brings you a rather pleasant selection of Buchschmid and Gretaux wood inlay pieces, some of which you may not have seen before. 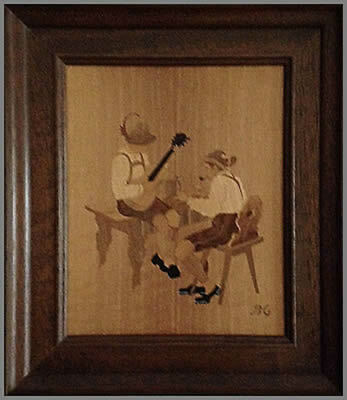 Plus we have some information regarding the Buchschmid and Gretaux Wood Inlay workshop. 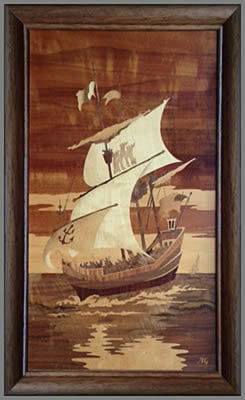 Our January update brings you some new items of Buchschmid and Gretaux wood inlay work you may not have seen before. 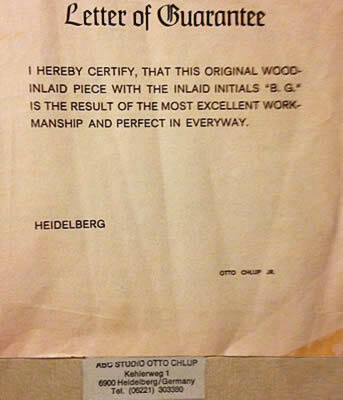 The "Letter of Guarantee" from Otto Chlup's ABC Studios is certainly one of those pieces we have not seen before. We have to thank web visitor Carol Davis for sending it in. We thought we had already seen most things 'Buchschmid and Gretaux', however the certificate / letter seen lower down on this page is a new discovery for us. But, changing the subject a little; an enquiry came into us a few weeks ago asking if we knew the location of the Buchschmid and Gretaux Wood Inlay Workshop. We did have the address on file, and, from what our enquirer told us, it seemed possible that the B & G workshop premises could easily still be in existence. This started us off on a trail of enquiry ourselves. After much Google searching and several e-mails we were able to confirm that the original building still remains in its location outside Stuttgart, Germany. 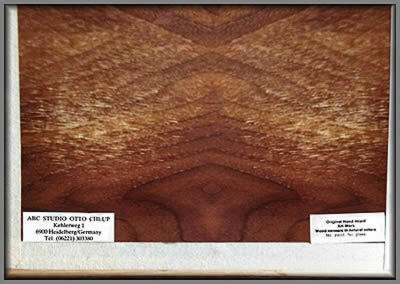 We then did a Google Earth search and zoomed in on an aerial view of the Buchschmid and Gretaux Wood Inlay workshop. Unfortunately there didn't seem to be a street view of that area, just an aerial view - but none the less, it was still very pleasing to see the photographic existence of the original B & G workshop. The Heidelberg address you see so much associated with the Buchschmid and Gretaux Wood Inlay Company is actually the address of the B & G main agents and representatives ABC Studios of Heidelberg. Otto Chlup and his son Otto Chlup junior were the owners of ABC Studios. If you enter: Kehlerweg 1, D-6900 Heidelberg 1 into Google Earth or maps it returns a street scene with the red pointer highlighting a building with car parking next to it - would this be, or would it have been ABC Studios? Perhaps one of you who have a good knowledge of the area would be kind enough to tell us if what we have been looking at actually is the genuine location of ABC Studios - we would really love to know if we are correct, thanks for your help. 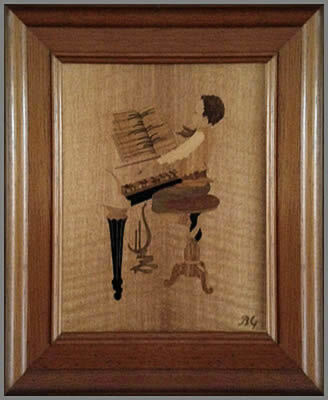 But, getting back to Carol's Buchschmid and Gretaux wood inlay pictures, we are pleased to note that there appears to be no signs at all of any varnish cracking on any of Carol's pieces. This shows that they have been kept in the proper environment which is conducive to the well being of such prized artistic wood inlay pieces. We have said this many times before, but if you want to keep your Buchschmid and Gretaux wood inlay pieces in the best of condition, do try to keep a little moisture in the air. We don't mean a Turkish Bath style of moisture laden atmosphere, just a small container of water in the vicinity of the pieces will provide sufficient moisture in the air to keep the pieces in good condition and prevent any cracking of the varnish. If cracking has already occurred, then you may just have to live with it. Getting the piece re varnished will lower its market value unfortunately. "Kogge - A Pirate Ship"
"The Guitarist and the Zither Player"
Click the above button to return to page 58 of "Can You Help"